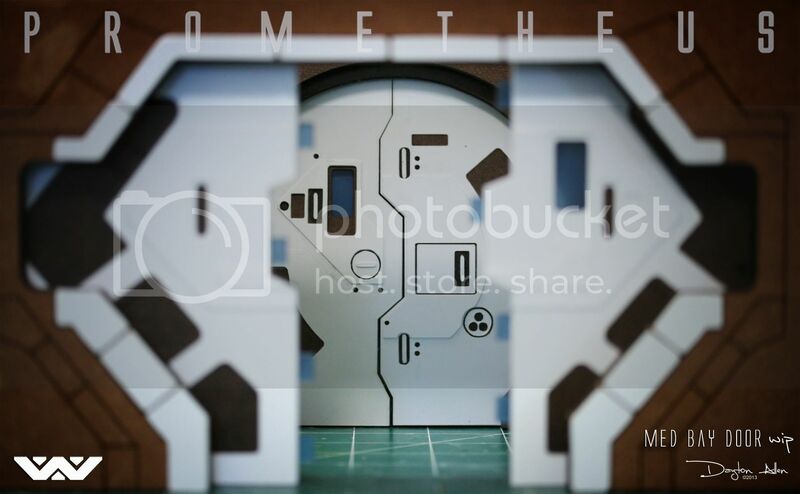 My latest work is creating the Nostromo's Main Air Lock door as seen in the film. 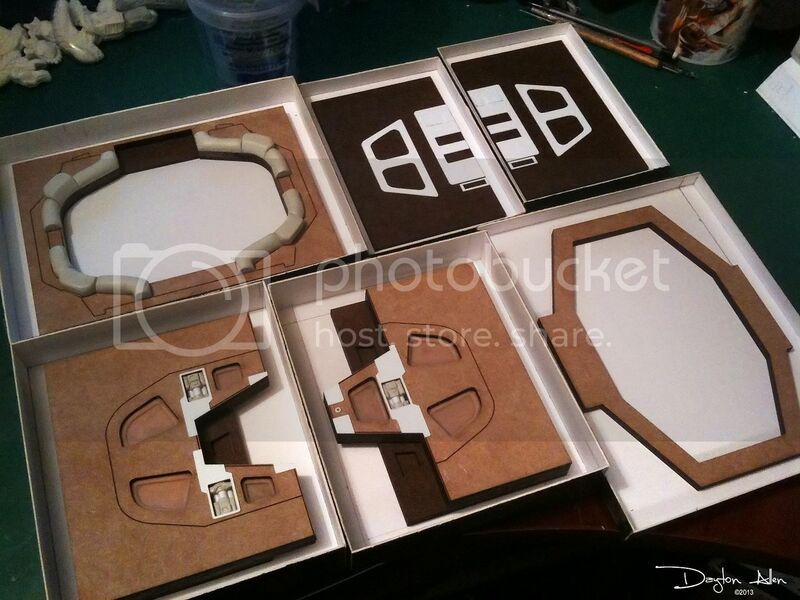 I started with a foam core/matte board model to get the scale right. 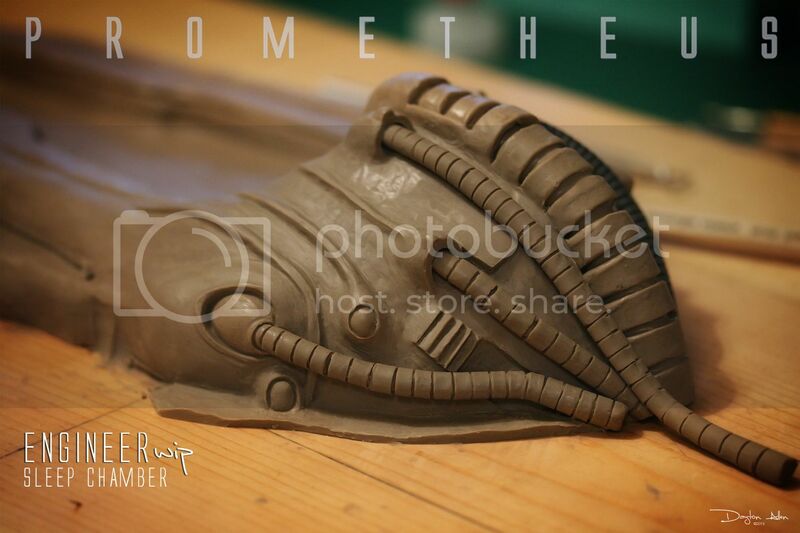 Once the molds were made, I made a casting of the finished piece. The door contains both sides - interior and exterior. 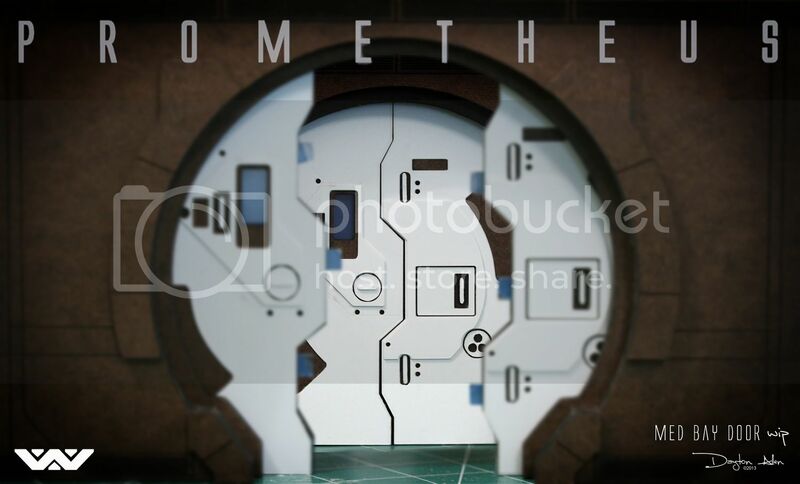 Below is an images of the exterior and the custom frame I am building that will hold the door into place. I've also began working on the build to the interior compartment of the Main Air Lock. 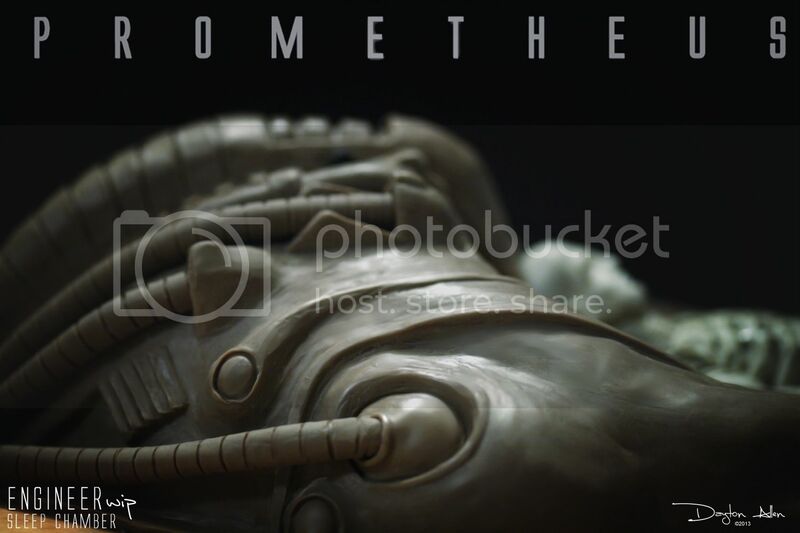 Images of that will be coming soon. 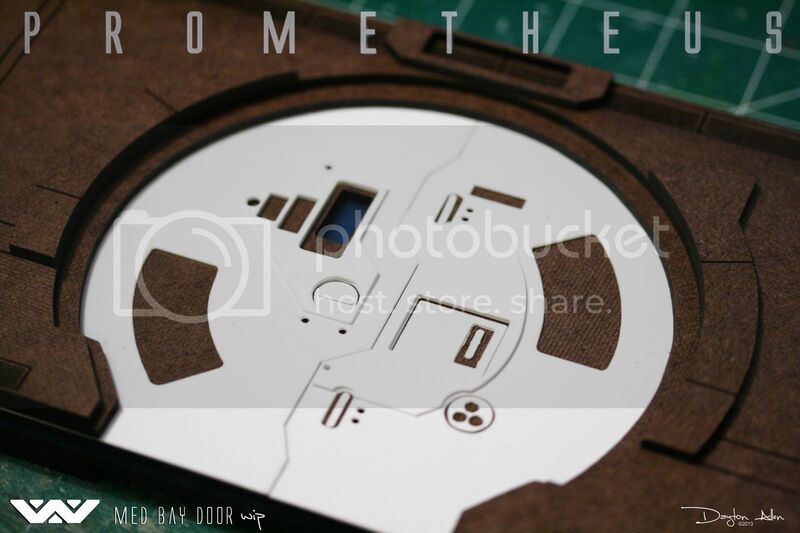 I scratch build using sheet styrene, laser cut materials and coming soon - brass etched pieces (my first time). This work is "for the love of the hobby" at the moment but I can see where I may be selling kits sometime in the future so please let me know if you would be interested. Till then, thanks for taking a look! Much more on the way!!!! WELCOME on the board Dayton ! wow this is stunning! really wonderful work. I've seen your stuff before too. Liking your Air lock door. You cant beat a bit of laser cutting. 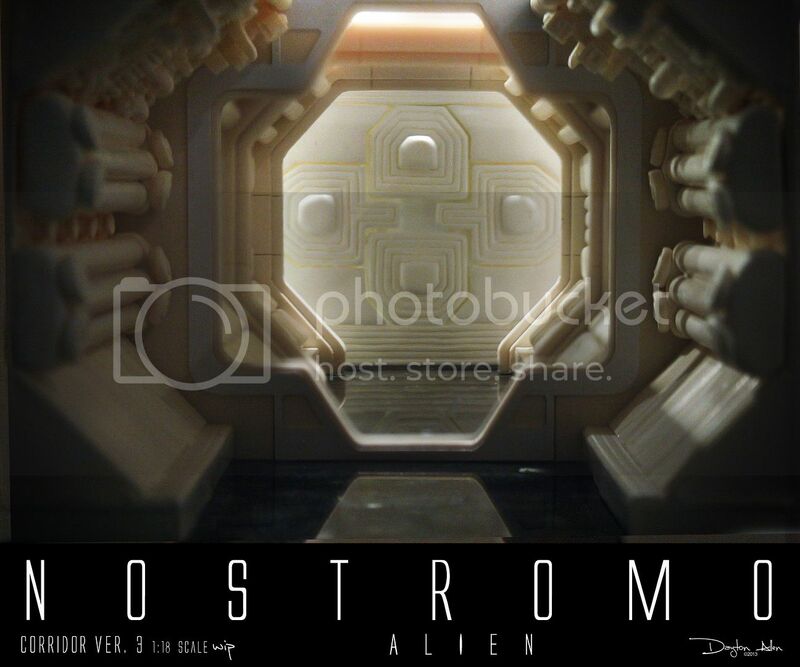 Close to completing the first of several 1:18 scaled corridors for the Nostromo spacecraft (ALIEN 1979). These corridors will vary in length, complexity...depends on what section or deck they are located within the ship. So many variants on the ship - I found this awesome video online that features the door and corridors on the ship...it's like the author read my mind. 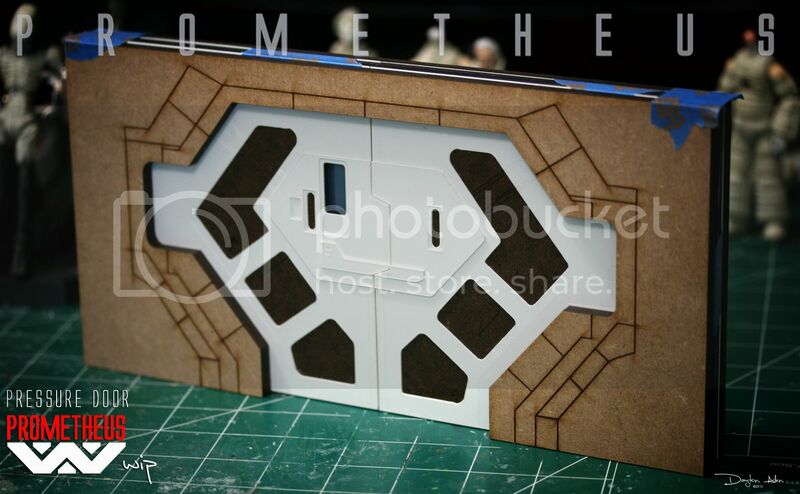 Here are a couple images of the first completed corridor - lacking smaller details, the base (being worked on now) paint job and decals....so how about CLOSE to completion LOL! Started a new section that leads to the Narciccus Shuttle - you can see this section as Ripley is escaping from the Nostromo, approaching the shuttle entrance. 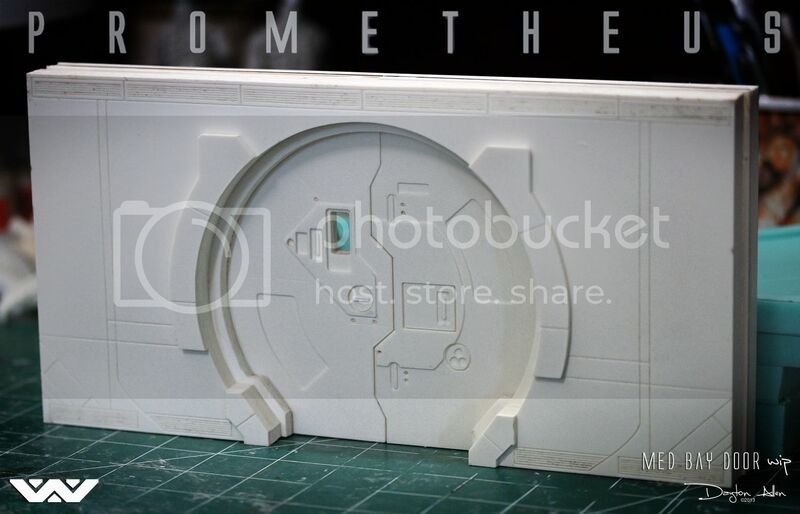 Sculpted and replicated the padded seat railings in the Main Airlock Chamber, also scratch built the dust grate floor from sheet styrene. Additional details are being added over the weekend. 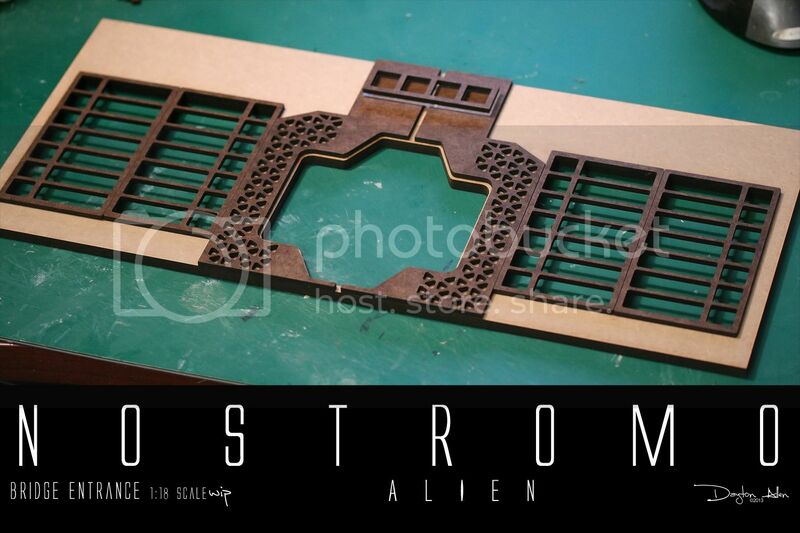 Started a new section this past week - received various laser cut pieces I designed to begin assembling the main entrance way to the Nostromo bridge. 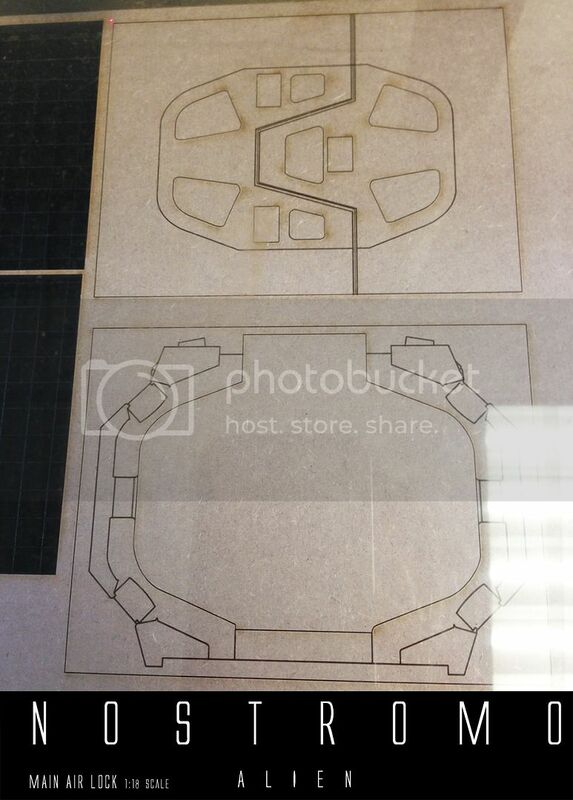 The image shows just the laser cut pieces (hastily put together for the photo - nothing glued down). 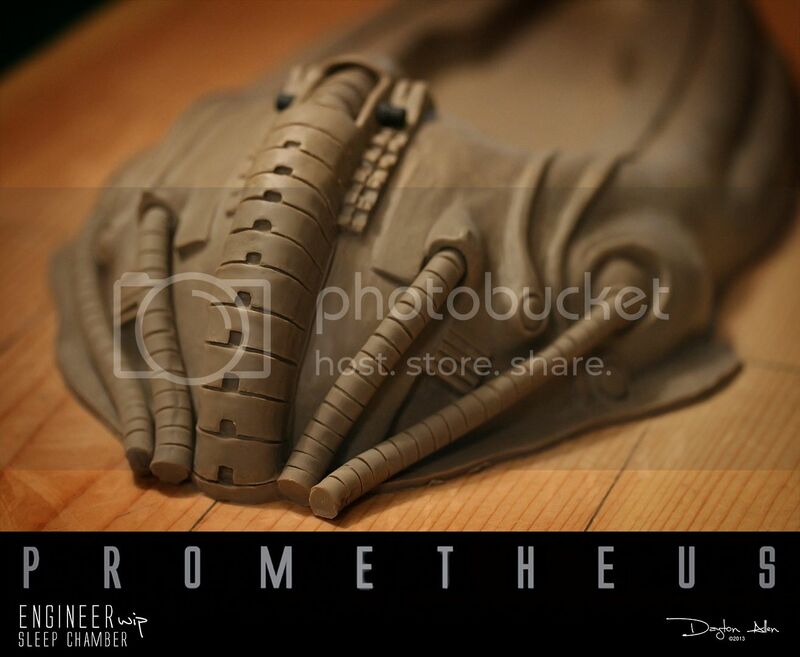 I will add details using sheet styrene, sculptural and greeblie work. 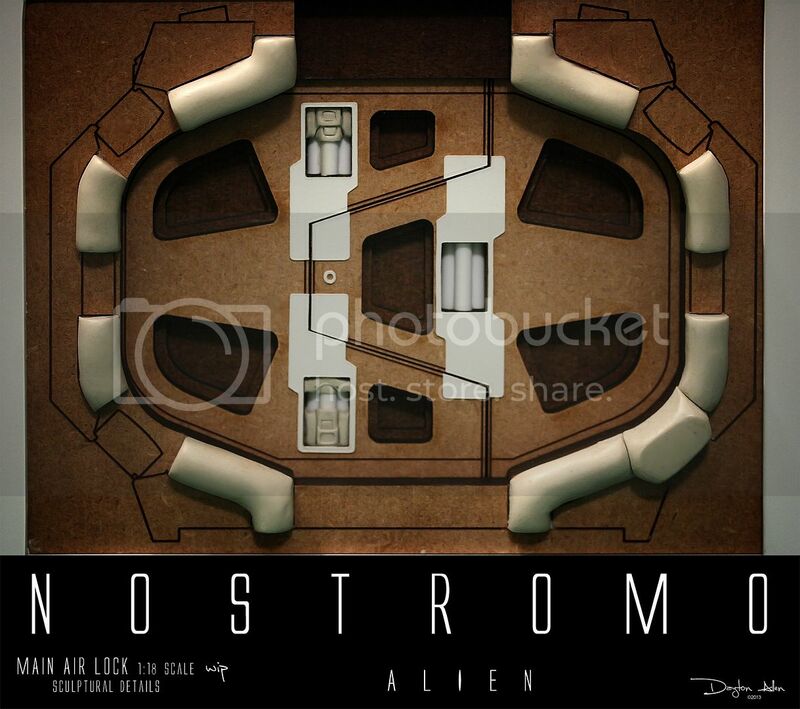 and finally I decided to reboot my Nostromo galley work. The panels I originally hand made looked too irregular. I had a problem with proportion. 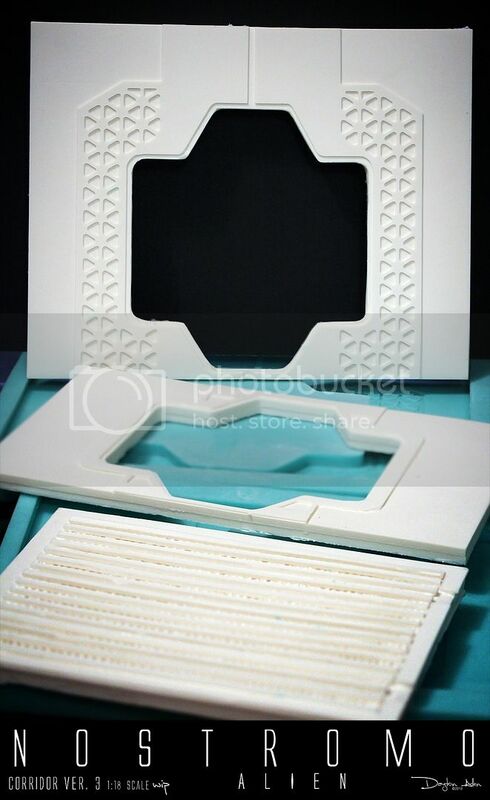 With these laser cut parts, I have a much better starting point when sculpting the details of each wall panel...that's right, the details for the Egyptian motif (as Ron Bobb called it) will be sculpted. Once these walls are completed, the opposite side and overhead will be created. I've wanted to do this for a very long time. Hence my Mess/Galley plans. But I've never got there. 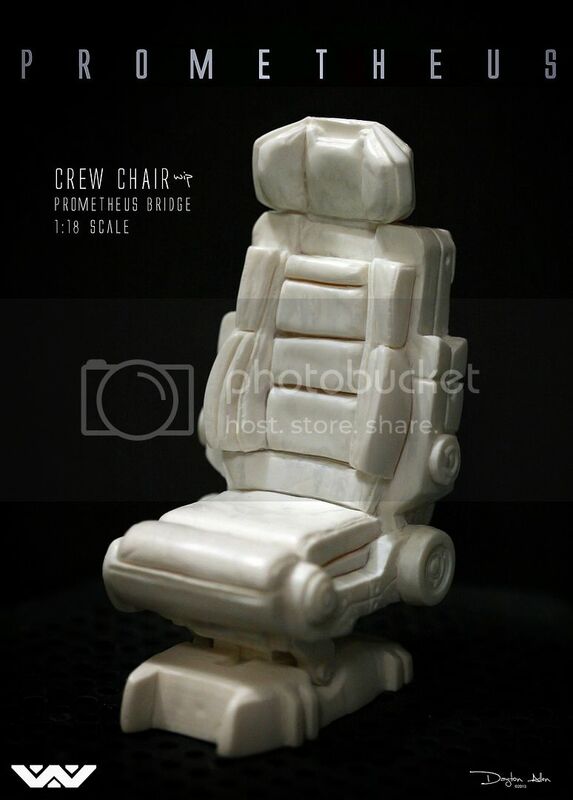 Say what you want about the movie Prometheus, you MUST agree that the art design for the film was TOP NOTCH! 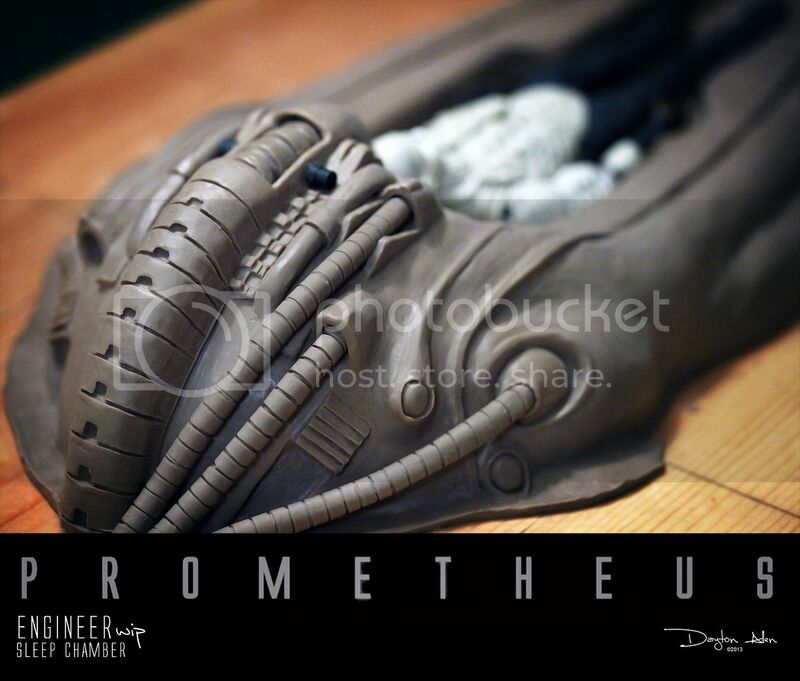 That alone inspired me to work on several Prometheus themed diorama work. The first sculptural piece I am currently working on is a 1:18 scaled Hypersleep Chamber used by the Engineers in the Orrery room. 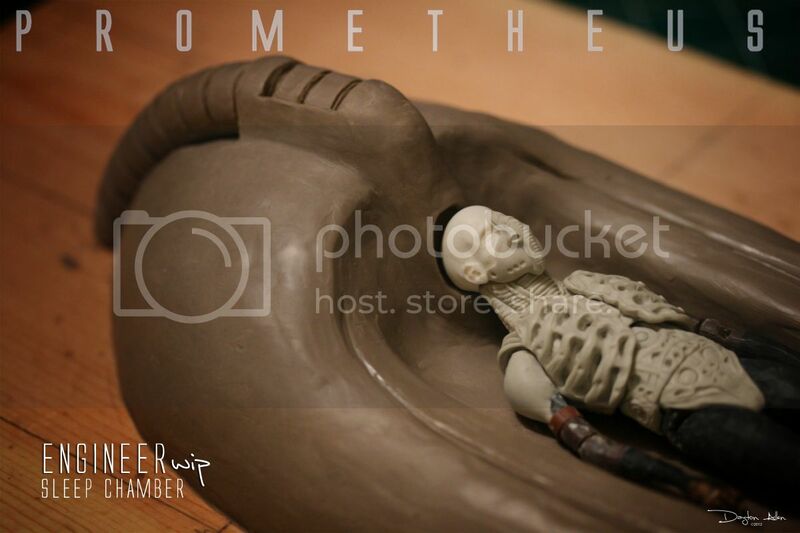 I am using Monster Clay as my sculpting material. 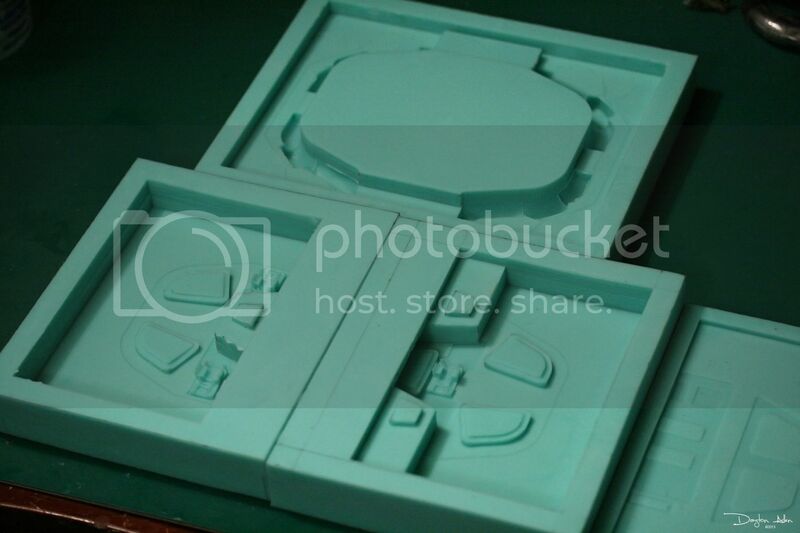 The piece will work hand in hand with the 1:18 scaled Engineers I am currently sculpting as well. My plans for the Hypersleep chamber at this point is to consist of four parts: The Hypersleep Chamber itself, a removable translucent canopy, a portion of the Orrery floor and finally a sculpt of a sleeping Engineer (static pose, non-articulated). Check out my progress in the images below. 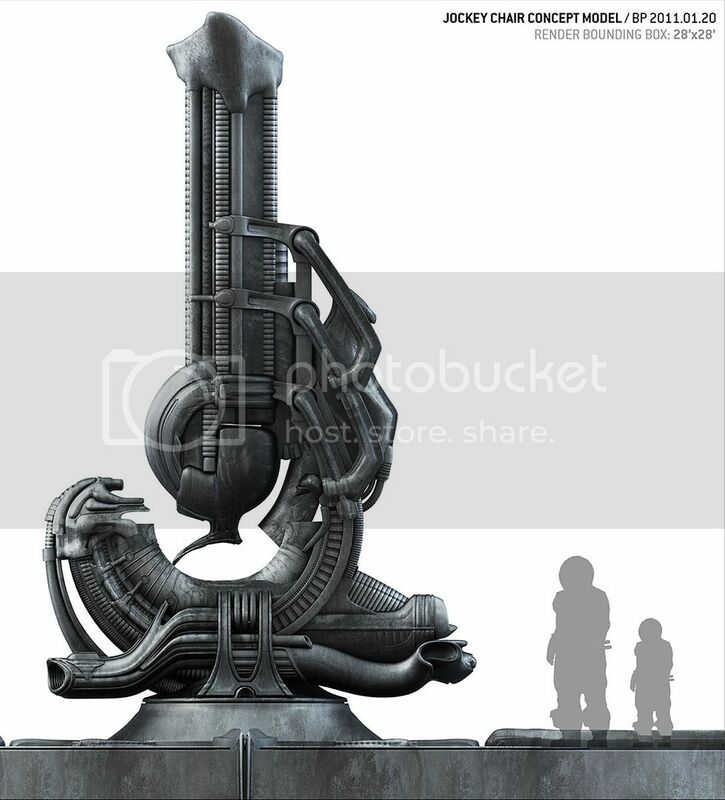 The first image was to mainly capture the shape. Moving forward I have been adding detail and making adjustments where needed. Currently working on the rear of the chamber which I feel is the most complex (you'd think). Close to completing one side - working on the opposite side tonight. After that I will move up the sides to the front of the chamber. 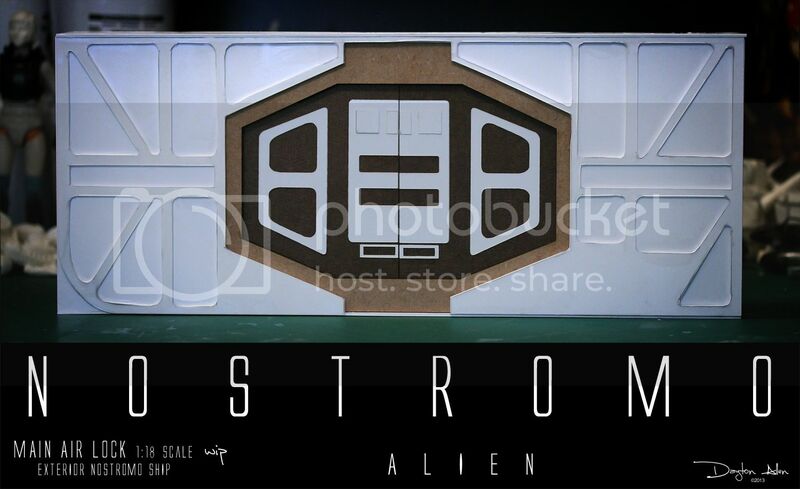 Like the Nostromo, I am also working on doors and corridors of the Prometheus ship itself....and similar to the Nostromo, I plan on building a 1:18 scaled diorama of the bridge. Below are some images of what I have already completed - a mix of vector/laser work and scratch building from sheet styrene and sculptural elements. Wow! F.A.B. Love what you're doing with all those set pieces. Eager to see the following installment! 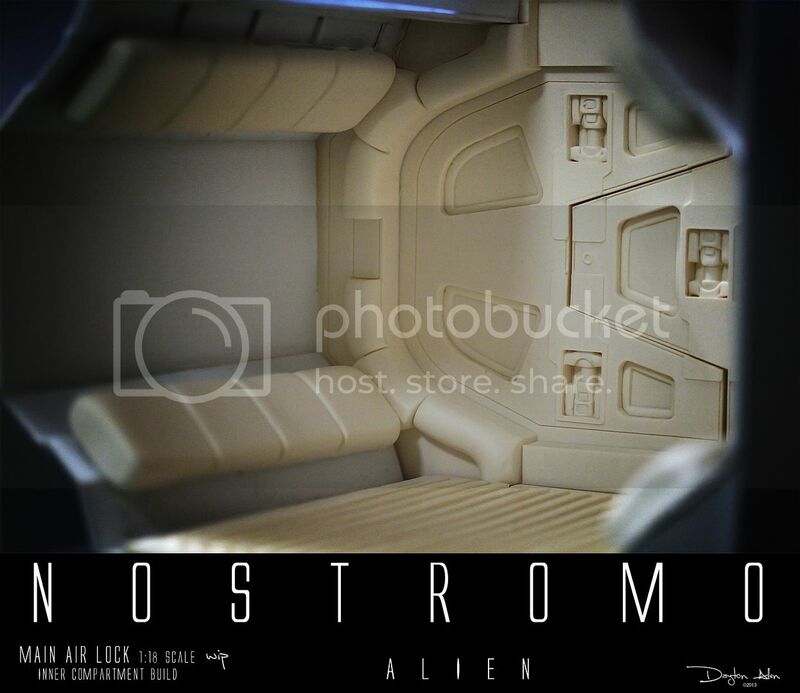 Hi everyone, this is my 1st post here in the Prop Summit Forum, and having seen some magnificent efforts made by folk with their Nostromo Interior Diorama models i thought i would like to share with you my efforts, I first started making Nostromo Interiors way back in 1982 along with some people relying on countless replays of Alien on VHS Tape, The Movie Novel,Scanlons Making Of Alien as well as my own sources ( I was given a set of photographs and schematics from a family friend) and various magazines such as American Cinematographer, Cinefantastique, Cinefex etc. 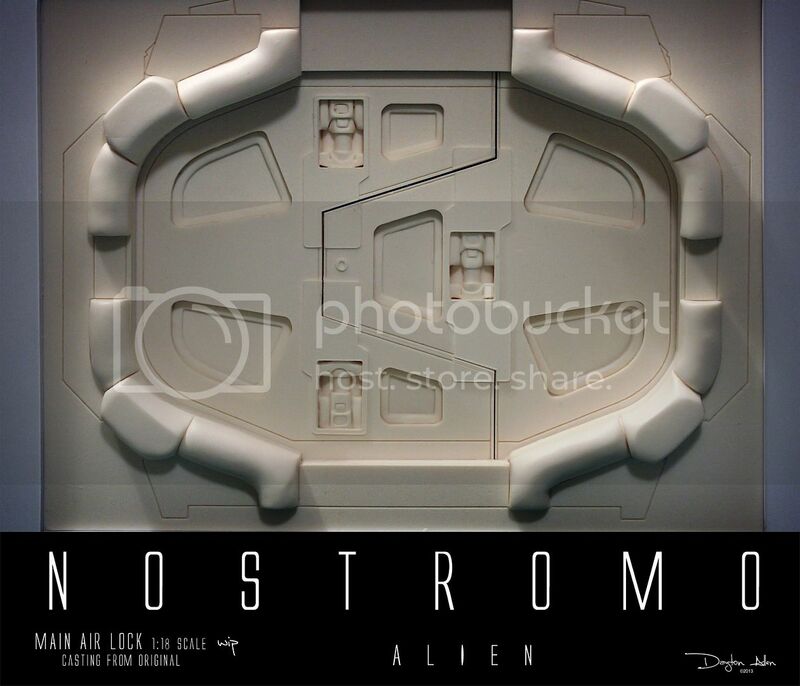 The first model i built was a speculative C' Level Corridor section using Mounting Board Media with added wiggets and a splash of acrylic for weathering, My latest work is on the Nostromo Main Airlock Vestibule : https://www.flickr.com/photos/88809084@N05/sets/72157648595457879/ you are more than welcome to have a look and let me know what you think! Its been fun and inspiration to see other folks real excellent input and exchanges of ideas and information concerning Alien and i hope i can be involved too! 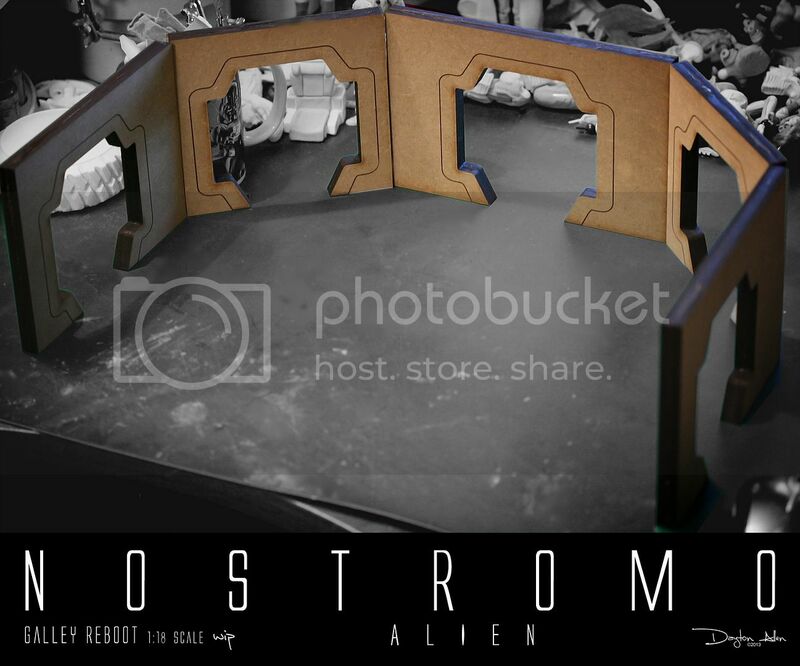 Many thanks Joberg, I would have posted some of the photos of my Nostromo Interiors but it seems the file size of the photos are too big for the "Upload Tool V.3" so hence the link i posted The Nostromo landing leg was a one-off curiosity event i was to build Ash's Blister room with the landing leg in the background for optical scale, but the Main Airlock lured me elsewhere and so focusing on that at the moment. 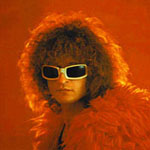 any suggestions on how to post up photos would be most appreciated as i am still in the Stone age (1970's!!) and only just mastered the use of a hammer!! The media i use for my models is basically Mounting Board, a stiff cardboard which in some circumstances can be easily sculpted and perfect for maquette construction, with additional detailing sometimes a trip to the Greeblie Box (wiggets) is in order, the hard work is to keep to the original appearance as much as possible--though with Blue Prints i would not rely on them too much as they would have been printed Pre-Production, and as you are aware reality and costs often creep in in a production!--and the temptation to improvise is very strong but i feel thats's not the heart and soul of the movie and i want to give a form of "Tribute" to the set designers and constructors ( Ron Cobb, Roger Christian, Micheal Seymour, etc..) as i go along small things creep up and changes to the models are often done--the Mess Room for example i recently discovered where the "Blank Doorway" is located a bench seating which i have never clocked before and it isn't certainly on the Blue Prints--along with the seating around the table gets moved about quite a lot in various scenes in Alien! 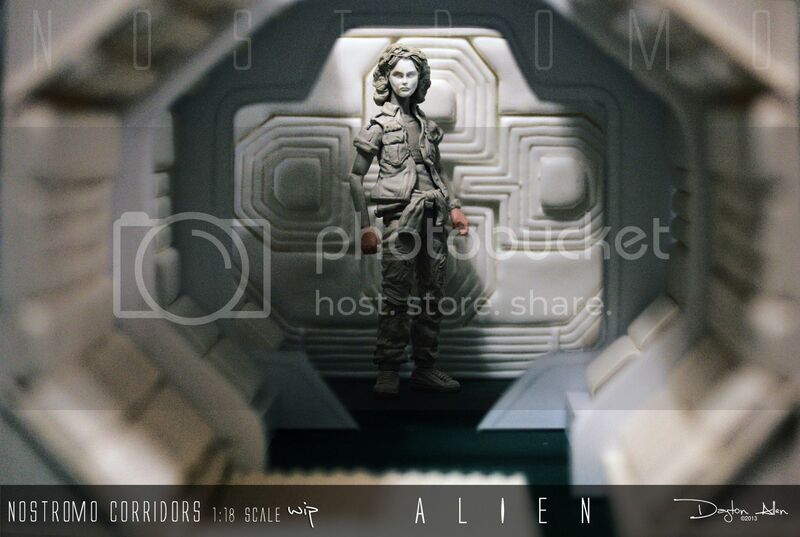 Are these the models you've been posting over on the RPF and Aliens Legacy? 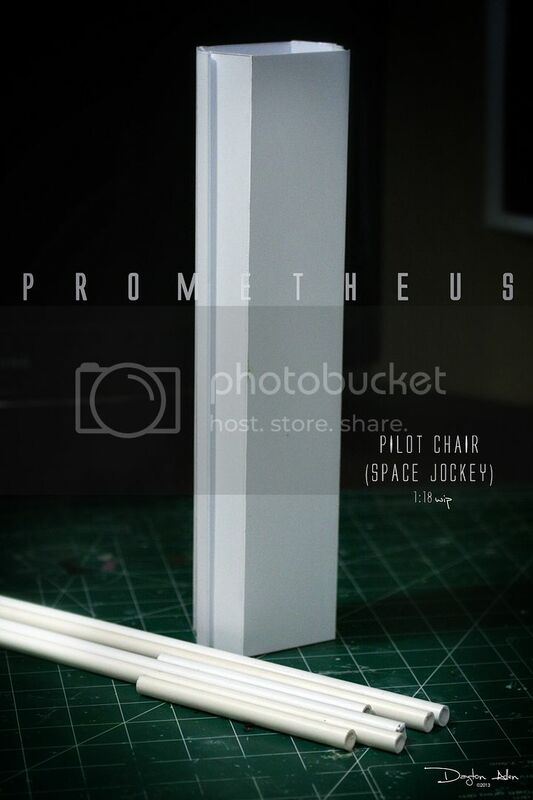 Very nice work, and if you are the same person good luck at the Leicester National Space Center show! 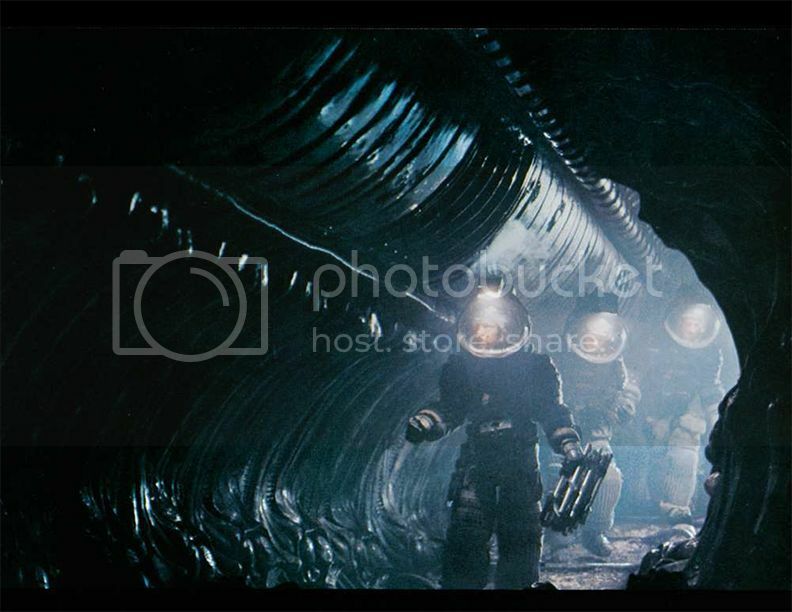 Many thanks Space Jockey, no i haven't posted anything on other forums--Alien Legacy Etc. though i have shared my photos of my Dioramas with Sith_fire 30 ( a fellow forum member here) as well as ideas and input. I know quite a few people have taken their creations to various exhibitions which sounds fun, but i barely have the time to be honest! Yeah, I look at Sith-fire's facebook page quite a lot, amazing stuff. 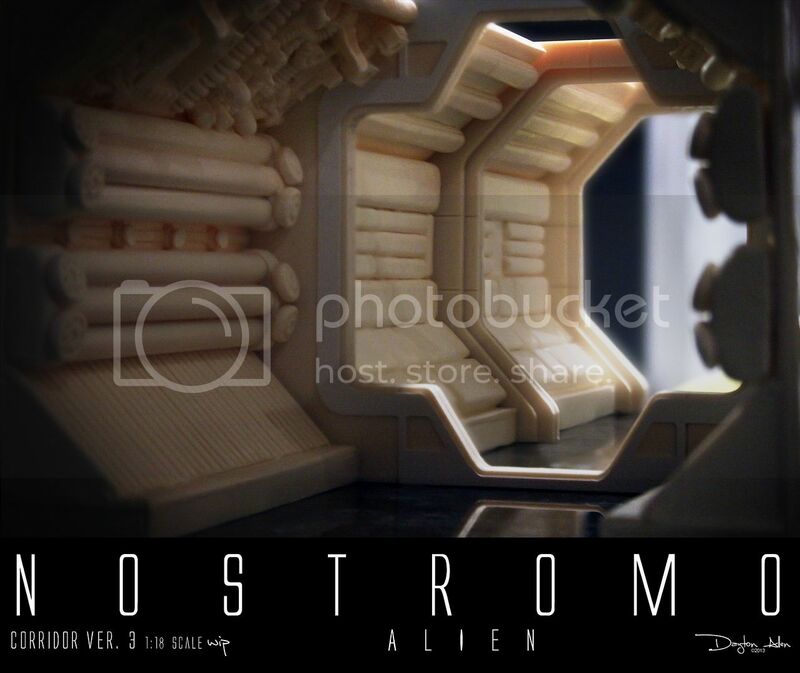 Seems like there are a few people now making interior set models of Nostromo. Again, nice job and keep up the great work!